Choose Orchid? So you are new to growing orchids and want to trying to choose an orchid, a pretty little orchid for your home. Or perhaps you want to give an orchid as a gift for a special occasion like Valentine's Day, or a birthday, perhaps for Mother's Day or an anniversary. Whatever the occasion, (or for no reason other than you LIKE orchids,) you want to be able to choose the right orchid for the situation. This is great. Many orchids are easy to grow, just as easy as many house plants, so choose orchids instead! Why not? They are elegant, beautiful and many like the Phalaenopsis (in the picture) have flowers that last a long, long time. You just need to be aware of a few things and factor them in your decision of what kind of orchid to choose. You want look at where this orchid will be spending its time. What is the light, what is the temperature, humidity that you can provide? 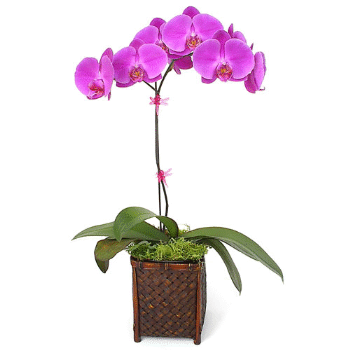 You need to choose an orchid that is suited to the environment that it will be living in while it is growing. Perhaps you just have to have that specific orchid because the orchid flower is so beautiful, or such an amazing color, or you just have to have it. I understand! Believe me I do! However, when you match the micro-climate that an orchid came from in nature to the environment that your home has to offer your orchid(s) will thrive! Below I have listed links to some other pages on this site that will help you with this decision. Check out these tips and get the Best Orchid for your home. Here are the questions I am most frequently asked by people new to orchid growing. These are really worth reading if you are new to orchids. As a buyer you here are a few things to be aware of when purchasing an orchid. This article will give you some tips and perhaps help you from of losing an orchid.